Version info: Code for this page was tested in Mplus version 6.12. Poisson regression is used to model dependent variables that are counts. Example 1. The number of persons killed by mule or horse kicks in the Prussian army per year. von Bortkiewicz collected data from 20 volumes of Preussischen Statistik. These data were collected on 10 corps of the Prussian army in the late 1800s over the course of 20 years. Example 2. The number of people in line in front of you at the grocery store. Predictors may include the number of items currently offered at a special discounted price and whether a special event (e.g., a holiday, a big sporting event) is three or fewer days away. Example 3. The number of awards earned by students at a single high school. Predictors of the number of awards earned include the type of program in which the student was enrolled (e.g., vocational, general or academic) and the score on their final exam in math. Let’s pursue Example 3 from above. The data for this example were simulated and are in the file https://stats.idre.ucla.edu/wp-content/uploads/2016/02/poisson_sim.dat. 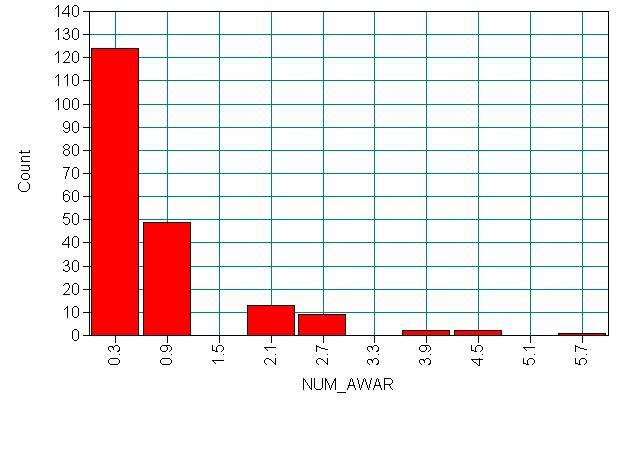 In this example, num_awards is the outcome variable and indicates the number of awards earned by students at a single high school in a single year, math is a continuous predictor variable and represents students’ scores on their math final exam, and prog is a categorical predictor variable with three levels indicating the type of program in which the students were enrolled. Poisson regression – Poisson regression is often used for modeling count data. Poisson regression has a number of extensions useful for count models. Negative binomial regression – Negative binomial regression can be used for over-dispersed count data, that is when the conditional variance exceeds the conditional mean. It can be considered as a generalization of Poisson regression since it has the same mean structure as Poisson regression and it has an extra parameter to model the over-dispersion. If the conditional distribution of the outcome variable is over-dispersed, the confidence intervals for Negative binomial regression are likely to be narrower as compared to those from a Poisson regression. Zero-inflated regression model – Zero-inflated models attempt to account for excess zeros. In other words, two kinds of zeros are thought to exist in the data, "true zeros" and "excess zeros". Zero-inflated models estimate two equations simultaneously, one for the count model and one for the excess zeros. OLS regression – Count outcome variables are sometimes log-transformed and analyzed using OLS regression. Many issues arise with this approach, including loss of data due to undefined values generated by taking the log of zero (which is undefined) and biased estimates. In the Mplus syntax below, we specify that the variables to be used in the Poisson regression are num_awards, p2, p3 and math. (The variables p2 and p3 are indicator variables for prog.) We also specify that num_awards is a count variable. (Because the variable name num_awards has more than eight characters, we get a warning in the output that this variable name has been truncated to eight characters.) By default, Mplus uses restricted maximum likelihood (MLR), so robust standard errors are given in the output. The MLR standard errors are computed using a sandwich estimator. These are what we generally call robust standard errors. Cameron and Trivedi (2009) recommend the use of robust standard errors when estimating a Poisson model. If you do not want robust standard errors, you can use the analysis: estimator = ml; block. After the heading informing that "THE MODEL ESTIMATION TERMINATED NORMALLY" comes the information about the model. It begins with the information regarding the log likelihood, AIC and BIC. These values can be used in comparing models. Then we find the Poisson regression coefficients for each of the variables along with the (robust) standard errors. The column labeled as Est./S.E. is the quotient of the estimates divided by the standard errors. These are basically z-scores if the sample size is reasonably large. 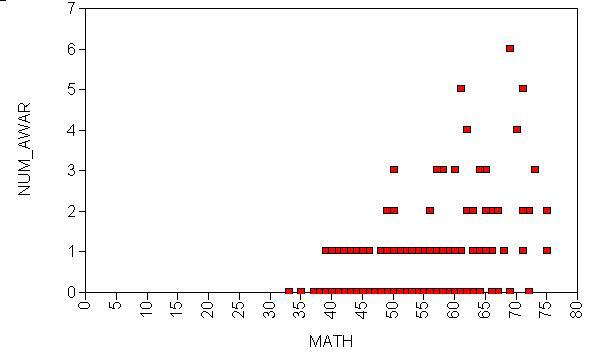 In the right-most column is the two-tailed p-value. The indicator variable p2 is statistically significant. 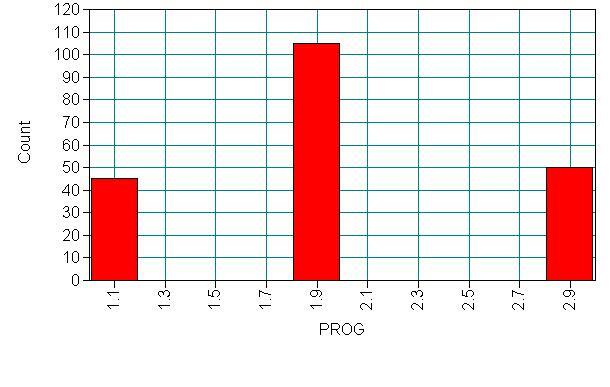 Compared to level 1 of prog, the expected log rate for level 2 of prog increases by about 1.1. The indicator variable p3 is not statistically significant. The coefficient for math is .07 and is statistically significant. This means that the expected log count increase in num_awards for a one-unit increase in math is .07. To determine if prog itself is statistically significant, we can use the model test block to obtain the two degree-of-freedom test of this variable. In the syntax below, some of the variables in the model are given labels. These labels must be in parentheses and must be the last item listed on the line, so the model is broken up over several lines. We have given the label a2 to the indicator variable p2, and the label a3 to the indicator variable p3. Once we have assigned labels to the variables, we can use those labels in the model test block. Setting both a2 and a3 to 0 allows us to get the two degree-of-freedom test of the variable prog. We can see that the variable prog, as a whole, is statistically significant. To help assess the fit of the model, we can look at the model fit statistics in the output. Several measures of goodness of fit are provided. For both the AIC and BIC, smaller is better. To obtain the results as incident rate ratios, we need to use the model constraint block. Again, we use labels to refer to the variables in the model. In the model constraint block, we use the new statement to label the new parameters, which will be the exponentiated parameters from the model. log(num_awards) = Intercept + b1(prog=2) + b2(prog=3) + b3math. When there seems to be an issue of dispersion, we should first check if our model is appropriately specified, such as omitted variables and functional forms. For example, if we omitted the predictor variable prog in the example above, our model would seem to have a problem with over-dispersion. In other words, a mis-specified model could present a symptom like an over-dispersion problem. Assuming that the model is correctly specified, you may want to test for over-dispersion. There are several tests of the alpha parameter, including the likelihood ratio test. One common cause of over-dispersion is excess zeros, which in turn are generated by an additional data generating process. In this situation, zero-inflated model should be considered. If the data generating process does not allow for any 0s (such as the number of days spent in the hospital), then a zero-truncated model may be more appropriate. Count data often have an exposure variable, which indicates the number of times the event could have happened. This variable should be incorporated into your Poisson model by taking the log of the exposure variable and constraining its estimate to 1. The outcome variable in a Poisson regression cannot have negative numbers, and the exposure cannot have 0s. The diagnostics for Poisson regression are different from those for OLS regression. The assumptions of the model should be checked (see Cameron and Trivedi (1998) and Dupont (2002) for more information). Poisson regression is estimated via maximum likelihood estimation. It usually requires a large sample size. Cameron, A. C. and Trivedi, P. K. 2009. Microeconometrics Using Stata. College Station, TX: Stata Press. Cameron, A. C. and Trivedi, P. K. 1998. Regression Analysis of Count Data. New York: Cambridge Press. Cameron, A. C. Advances in Count Data Regression Talk for the Applied Statistics Workshop, March 28, 2009. http://cameron.econ.ucdavis.edu/racd/count.html . Dupont, W. D. 2002. Statistical Modeling for Biomedical Researchers: A Simple Introduction to the Analysis of Complex Data. New York: Cambridge Press. Long, J. S. 1997. Regression Models for Categorical and Limited Dependent Variables. Thousand Oaks, CA: Sage Publications. Long, J. S. and Freese, J. 2006. Regression Models for Categorical Dependent Variables Using Stata, Second Edition. College Station, TX: Stata Press.